Scot Solida's new Christus and the Cosmonaughts album has just been made available as a digital download from Beta-lactam Ring Records as the full CD version of the original LP plus two additional bonus tracks. Solida describes the album as "utterly chocked to the brim with Kyma goodness." One of the tracks, "The Fractured Faithfull" was done entirely within Kyma, but no track was untouched by the Kyma/Capybara combo. Solida warns that "spinning the artwork on a turntable has been clinically proven to cause lethargy in children and dust mites." 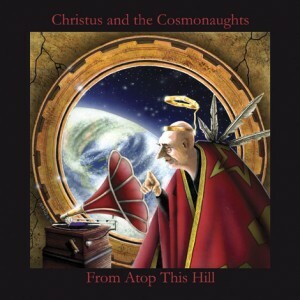 Beta-lactam Ring Records is shipping the new Christus and the Cosmonaughts CD: From Atop This Hill. A distance-collaboration between Scot Solida and his guitarist (they've never actually met face-to-face), the album is described as "a psychedelic/progressive/art-rock hodgepodge featuring loads of Kyma" along with Scot's modular analogue synthesizer and other classic and vintage instruments. All vocal treatments were done in Kyma, as were many of the synthesized sounds on the album. In addition, the label has put together a podcast featuring Solida's music. You can view Solida's album art while listening to clips from the album (including the Tablets in the Timeline track which was done entirely with a Wacom tablet, Kyma, and guitar) on the Christus and the Cosmonaughts MySpace page. All clips include Kyma processing and/or synthesis.